What are those bumps on Counselor Troi’s forehead? Wait! That IS her forehead! She’s been kidnapped. 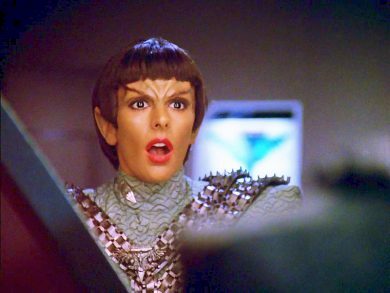 And yet, she is in command of a Romulan ship because – as far as anyone knows – she is a Romulan! Meanwhile a wayward ensign returns to the Federation, having defected decades ago. Now he has a message from – hang onto your hats – Ambassador Spock! Intrigue abounds as we put Face of the Enemy in the Mission Log.